A mouthwatering mixture of herbs and spices perfect with meat or vegetables. This product can be served over meats and vegetables. Water, soy sauce (water, wheat, soybeans, salt), high fructose corn syrup, lime juice from concentrate, red wine vinegar, salt, modified food starch, spices (including chili peppers and cumin), soybean oil, autolyzed yeast extract, caramel color, xanthan gum, potassium sorbate and sodium benzoate used to protect quality, natural flavors, natural smoke flavor. Ready-to-Use Sauces offer signature flavors to boost menu excitement. The extensive line covers global flavor trends with authentic ethnic ingredients from around the world. 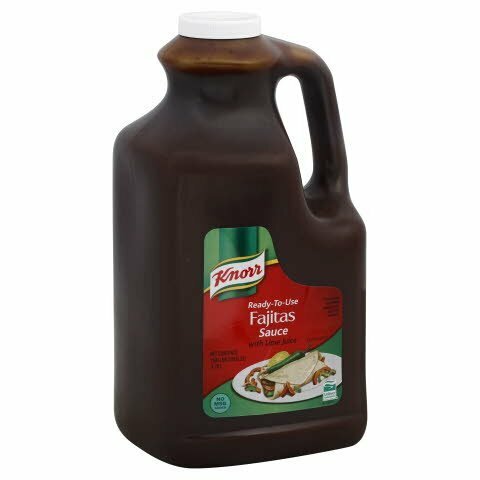 These sauces feature ready-to-use convenience, the ease of shelf-stability, and many versatile uses.